It's hard to imagine American popular music without the Fender Stratocaster. Last month, the favorite of Jimi Hendrix, Stevie Ray Vaughan, and Eric Clapton turned fifty years old. 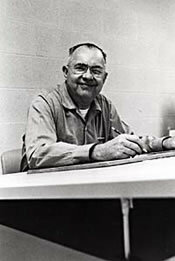 So who was Leo Fender? And how did the legendary Strat come to be? Thirteen years after he was born on August 10th, 1909, in his parents' barn on their ranch in Fullerton, California, Clarence Leonidas Fender became an electronics hobbyist. In 1921, his uncle sent him a storage battery and discarded automobile electronic parts. A year later, Fender visited his uncle in Santa Maria and saw a homemade radio he had put on display in front of his shop. The music blasting from that speaker made an impression on young Fender. Before he knew it, he was building and repairing radios for friends. In 1928, Fender graduated from Fullerton Union High School and went on to study at Fullerton Junior College where he majored in accounting. After that, he worked as a delivery man for the Consolidated Ice and Cold Storage Company in Anaheim, then as the bookkeeper. Throughout this period, he continued to work with electronics, repairing radios at home. In 1932, Fender met an orchestra leader who promoted dances in Hollywood. He soon hired Fender to build the first of several PA systems. (In the early thirties, Fender also met Esther Klosky and married her in 1934.) Then Fender went to work as an accountant at the State of California Highway Department in San Louis Obispo. Several years later, he moved on to work for a tire company. Six months down that road, in a shakeup of the accounting department, Fender found himself unemployed, so he borrowed six hundred dollars, returned to Fullerton, and opened a radio repair shop: Fender Radio Service. Soon Fender found himself working with more than just radios when his guitar-playing customers brought in their external pickups for repair. At the decline of the big band era, on the eve of rock and roll, Fender began making custom guitars and amplifiers. Starting where Electro String, Vivi-Tone, and other manufacturers left off, Fender invented an improved electric guitar, and by the mid forties, he started the K & F company with "Doc" Kauffman, who had helped design some of Rickenbacker Electro's guitars. Then in1946, Fender went on to start The Fender Electric Instrument Company. In 1948, he partnered with George Fullerton, designing the solid electric Broadcaster, renamed the Telecaster. Soon to follow were the Precision Bass guitar in 1951, freeing musicians from the cumbersome upright instruments, and the legendary Stratocaster in 1954. The revolutionary Strat featured a new contoured, double-cutaway body, a string-bending (tremolo) unit, and three (as opposed to two) single-coil pickups. In the mid sixties, Fender became ill and sold his company to CBS for thirteen million dollars. After his health improved, he worked at CBS/Fender for a few years before resigning in 1970. In his later years, he had several small strokes and progressive degeneration from Parkinsons disease, but he still continued to work on improving the tools of music until the day he died, Thursday, March 21, 1991. For more than fifty years, Fender electric guitars and amplifiers have affected the way musicians compose and play music. As jazz musicians began to experiment with amplifying traditional hollow body guitars and bumped into feedback problems, Fender and his partners created solutions, inventing one of the most important instruments in rock and roll, the Fender Stratocaster.